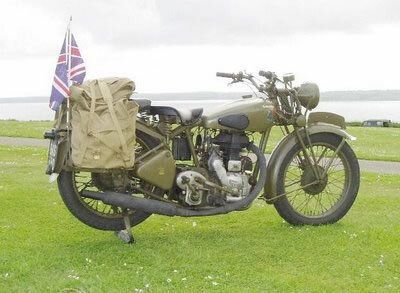 A long time ago, in a galaxy far, far away, there existed a British Motorcycle Industry. It had been present at the birth of Motorcycling and had spawned many exciting developments along the way. However, it had managed to push its head so deeply into the sand that the first thing it knew about any real competition to its existence was when it felt a deep, violating stabbing coming from its exposed rear. Still its head stayed down and almost without exception, it withered and perished leaving little more than blue plaques on walls where once monolithic factories had produced great machines that thundered off of production lines. Then, from over a distant horizon came a once familiar sound. At first, some thought it to be the ghost of Keith Moon keeping the beat on his Bass Drum. Others thought it was the sound of Thor and Woden battling it out in the heavens above. "Dub-Dub-Dub-Dub" On and on it went. Getting closer and closer, - yet still oh-so-distant. Then, from a garage forecourt, somewhere on the A38, came there came a plaintive cry. "Quick, - Mother, throw some sand on the forecourt, I can hear an Bullet, and it's coming this way!" Few had remembered that, at the closing of an Empire, the very technology that had caused the demise of the Industry had been exported to the only nation who could be trusted to keep the dream alive and carry on like the Sorcerer's Apprentice making the same old thing, in the same old way, because no one said to do otherwise. India had been making bikes based on the machine that they had admired and chosen for their Armed Forces and Police so many years ago. Now manufactured to the highest of standards with CNC machining and even tightening up some of the nuts and bolts. They were now being rewarded with being able to find a ravenous market back in "Dear Old Blighty". So many people are proud to be able to own a link to such a worthy inheritance but sadly many of them only get used as "Garage Ornaments" and for physiotherapy by over-polishing with "Magic Cloths" and potions. This is the record of three variants of the saviour being taken on a 4500 mile expedition from the UK to the southernmost tip of the European mainland Gibraltar,..........and then back again. 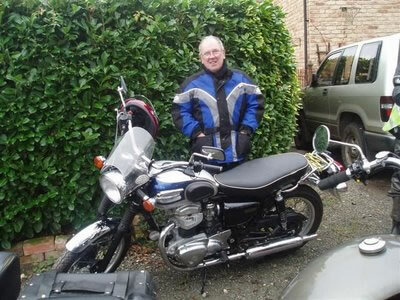 Bill has a 350 Enfield which he is loath to give up as it is the reasoning behind his nick name. It is rumoured that he is going to switch to anthracite in it as a fuel to assist the current climate problems. 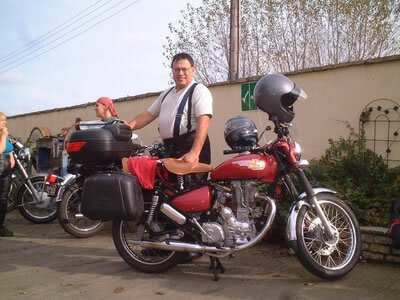 The bike that Bill took to Europe was an Enfield Bullet 500 electric start. He bought it for a few hundred quid in several baskets and proceeded to resurrect it from the floor up. The fact that it generally held up for a 4000+ mile trek is testimony to his skills and confidence as a mechanic. I apologise for having to use a picture with a Kawazaki in it on a Blog about Enfields but, as you will see as this Blog continues, this is the only incident, on record, where Bill is smiling. Henry is the proprietor of Price Parts Motorcycles and it was his stupid idea to go on this trip. For those who don't know Henry, he supplies an excellent service in all aspects of anything Enfield and, I have to say that, to watch him set about fixing a non running, fully loaded bike, spanners and oil flying all over the place, in temperatures of 35 degrees, while you and your mate wander across the road and have an ice cold beer is truly a sight to behold. 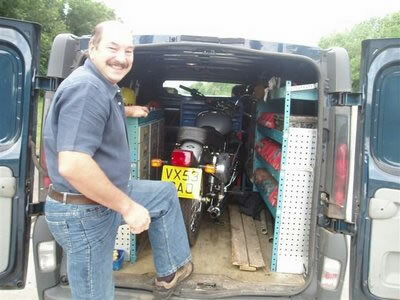 Henry's daily hack is a Royal Enfield Lightning 535 with many mods. Samarat rockers, lightweight piston, rollerbearing big end, upgraded oil pumps, en-suite panniers..... the list goes on and on. It's more of a work in progress considering that Henry rarely has less that six bikes ready to go in his workshop and enough spares on the shelf to build another six. The one mod that Henry did to his Lightning for the trip was to copy my mod by removing the twin seat and fit the "fat arse" U.S. style sprung solo seat. To this is added a piece of sheepskin. You may laugh but no more "Enfield Arse"! Yours truly from Chepstow, South Wales. I've had an Enfield, of one sort or another for about 5 years and recenty went for the Electra with the alluminium lean burn engine. I also had my Tom Tom Sat Nav with the maps for Western Europe. We decided that, rather than be led by the nose for the whole trip, we'd use the Sat Nav to get us out of the clag when we got lost beyond redemption. I'd installed a weatherproof 12-volt cigarette socket into the battery cover to power the Sat Nav, Mobile Phone and Ipod chargers. All three of the bikes were extensively serviced prior to departure to the extent that even when wheels were removed for tyres, tubes and tapes, wheel bearings were replaced. It's much easier to do something like this at one's leisure than on a fully loaded up bike in the heat of the noon-day sun somewhere. Henry made use of his copious panniers to take as many spare as he thought we might need and could manage to squeeze in. On top of this, I had spare cables, tubes, a mini compressor, and as many tools as I could manage. Bill had one of his wife's old leather handbags with a selection of tools, a compact, comb and a lipstick! Now there's confidence for you. He must have thought he was going to get lucky at some point. Henry and I both had cycle computers fitted to allow for a more accurate record of mileage and speeds etc. We had enough cable ties to tow a small ship, various nuts and bolts and, most importantly, full breakdown and repatriation cover. We had all bought camping gear. Bill's first atempt at a tent was a £12.99 thing from Argos. It turned out to be the sort of thing you might buy for the kids to use in the garden on a Sunday afternoon. He had a "try-out" in it and found it was more akin to a canvas coffin. Henry and I had also bought weatherproof "stuff bags" which proved invaluable. Added to that was a liberal amount of bungees, super glue, magic metal, liquid gasket, copper grease, spark plugs, insulating tape, rabbits foot....... and we were good to go.